You have to start somewhere. If you have read my posts, you know I’ve declared a War on Stuff. The reasons are pretty simple. Stuff wastes a lot of time. Storing stuff, cleaning stuff, buying stuff to clean your stuff, looking for stuff, shopping for more stuff and the list goes on. Check out George Carlin on stuff, it’s a guaranteed laugh. If you’re interested in getting rid of stuff and decluttering your life, but haven’t found the time to get started on it, I’ve come up with a simple way to have a constant reminder in front of you each day. We set up a box in the hallway right next to the hamper. Any time SuperK or I come across something we no longer use or want to get rid of, we drop it in this large cardboard box. Usually, after a month or so, the box is nearly full and we can quickly pack up and run it over to Goodwill or call Purple Heart and they’ll come pick it up. You can also reach out to the Lupus Foundation who also does at home pickup. The box also comes in handy when I’m trying to do some quick decluttering. I can toss in old baby books, toys, videotapes, as long as it’s something that may be usable to someone. I’ll admit I’m not sure who’s going to want that Big Chill soundtrack on cassette but I’ll leave that up to the folks sorting through all this treasure. Don’t get too hung up on the quality or age of the clothing or items you pass along, as long as it’s clean. If it’s not up to Goodwill standards (yes, there are standards) they generally make it into rag stock or recycle it — which is much better than it ending up in a landfill. 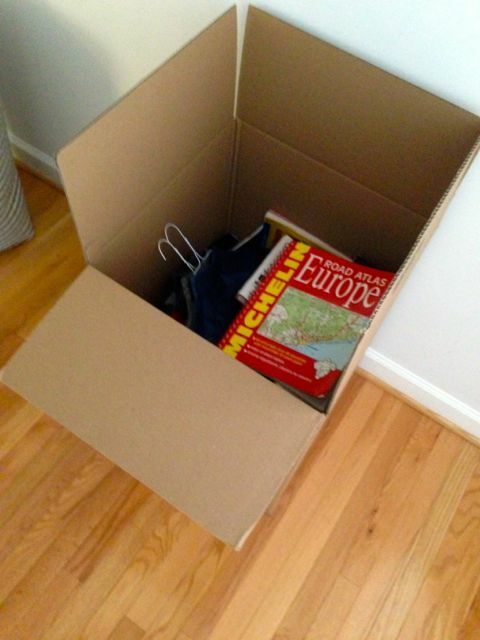 If your box isn’t filling up, you may need to schedule about 30 minutes of decluttering a week. If just one or two family members, roommates etc. participate, that box will fill up quickly. This is especially important just prior to the winter months when shelters really are looking for old sweaters, jackets, coats and anything warm. Don’t just wait till spring cleaning rolls around. Get rid of that stuff! Hooray! Congrats on the blog. You will find that Emily and I are probably both very on board with your mantra – we both live in small houses and don’t have the time or energy for extra STUFF! I almost always have a goodwill bag going, and drop it off when it’s full. A few times a year, James and I walk around our house together and pull out stuff to sell or get rid of. We just did that last weekend – I currently have 3 things listed on eBay and one on Craigslist. Stacy, thanks for the comment. I agree the war on stuff is all about getting rid of things that have no value add. I’d like to think that some of the stuff we give away ends up in someone’s home for a very long time. I did a craigslist curb alert on a partially rotted adirondack chair and it was gone in 15 minutes. I also plan to add some posts on “working lean” very soon. Thanks for the words of encouragement.